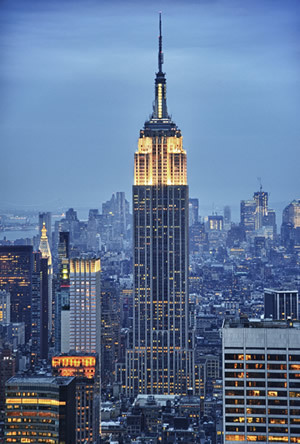 When the iconic Empire State Building in New York City unveiled a newly designed entrance for their Observation Deck attraction, Gunnebo was chosen to provide a secure entrance solution for the thousands of daily visitors that arrive each day seeking breathtaking views of the city. 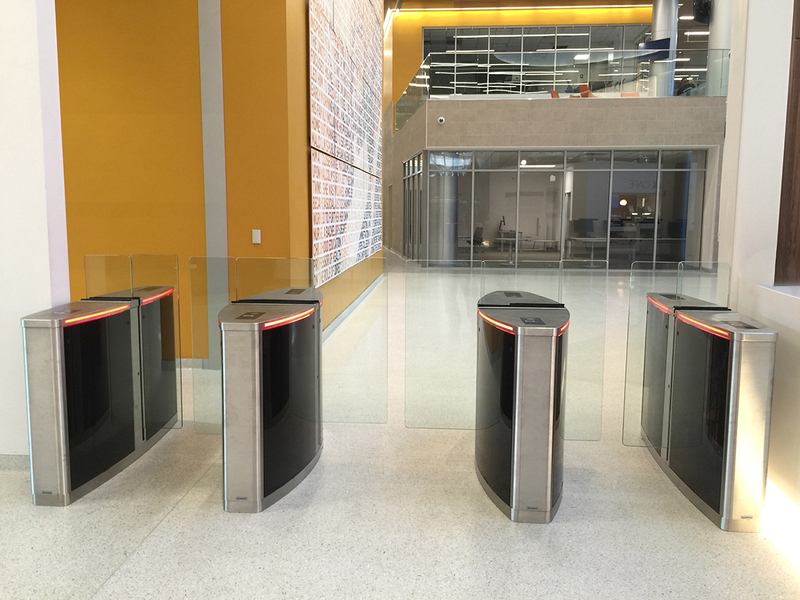 Working closely with the building owner Empire State Realty Trust and the technology integration team, Gunnebo delivered five lanes of highly customized OptiStile 720 Speed Gates, along with three lanes of custom SlimStile SE tripod turnstiles. Both turnstile designs needed to incorporate peripheral technology products that the building wanted integrated to the turnstiles at the new entrance, including barcode scanners, LCD Touch Screens, Gateway biscuit PCs, hand-held scanners, locked access panels, and custom pamphlet holders. The highly customized OptiStile 720 turnstile was designed with completely custom dimensions at 10” (25cm) wide and 60” (152cm) in length to accommodate the peripherals and added security and safety that would be involved in processing the 4 million visitors each year. The custom SlimStile SE turnstiles incorporated many of the same peripherals, and the tripod casework was custom fabricated to match the design aesthetic of the OptiStile 720. Working closely with our Midwest Integrators, Gunnebo has multiple successful campus installations. We’ve been fortunate to partner with several higher education campuses to provide entrance control turnstiles. Many campus building entrances uses anti-theft detection systems, in addition to entrance security turnstiles. The anti-theft detection systems cause havoc to any other electronic device within range, and interfere with the turnstile functionality. Gunnebo was asked to provide a solution to this issue, to enable a complete entrance security system at busy campus building entrances. Gunnebo solved this problem without the high cost of removing equipment or modifying programs. We insulated the electronics inside the turnstile pedestals from being interfered with by the detection systems, creating an impenetrable enclosure so no outside magnetic waves or frequencies could cause any more problems. Success. 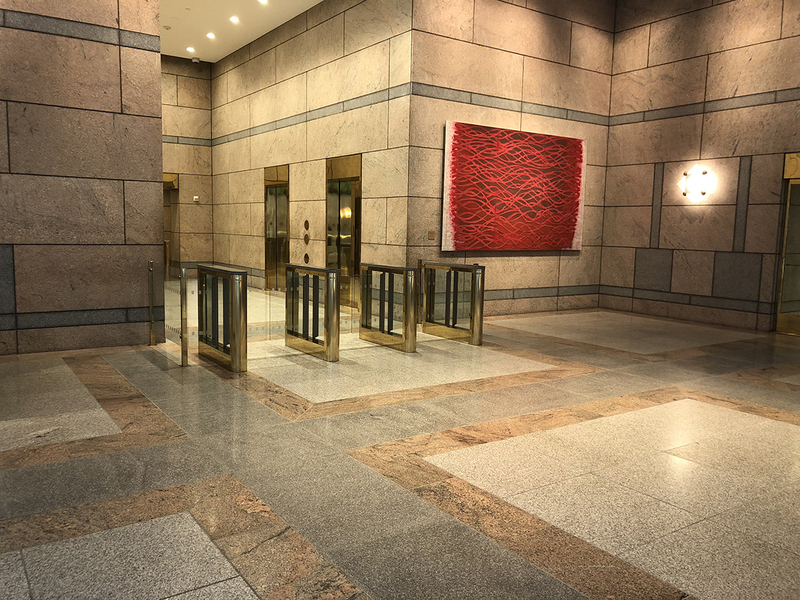 New building ownership brings together a top tier project team to modernize the lobby and introduce an entrance control turnstile system to a commercial office building located just around the corner from the newly rebuilt World Trade Center site. 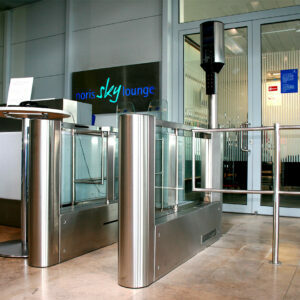 Create a modern, fast, secure entrance control system using the latest in access control technologies. Provide tenants and visitors to the building with an efficient, convenient, and seamless way to enter and exit the modernized building lobby. 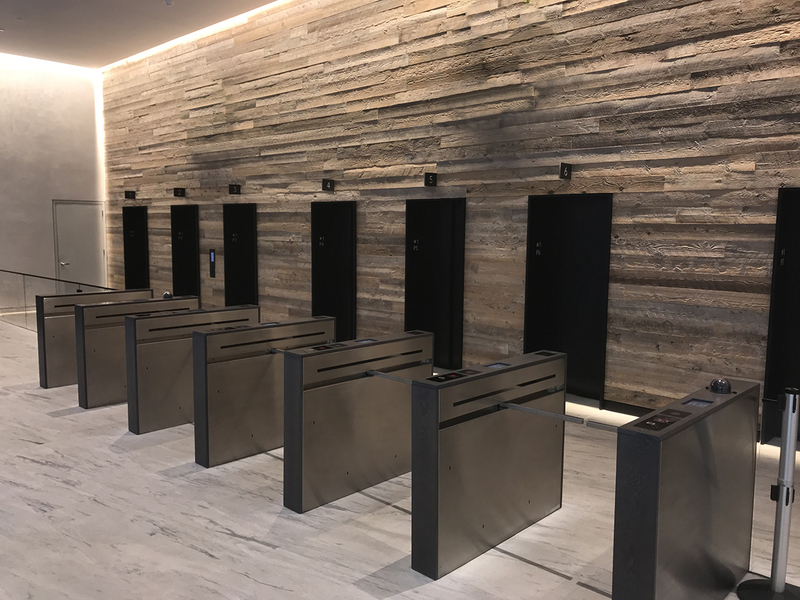 Six Lanes of OptiStile 220 series turnstiles were installed featuring customized wood cladding material, elevator destination dispatch screens, a facial recognition camera system as well as a smartphone based visitor management system. Lanes were delivered to site in a tight project time frame and installed in a high quality manner by a leading New York City security systems integrator. Columbia Square is a multi-tenant office complex in the heart of Washington, DC. The project was completed in 2011, and encompasses two main elevator lobby entrances along with a visitor check in areas. Hines is the sole owner of the building and acted as the developer and current property manager however was designed by the famed PEI Cobb Freed & Partners. Columbia Square is one of the most attractive DC properties accented by a grand 13-story atrium within the main lobby. Tenants include Hogan Lovells, Debevoise & Plimpton and the City Club of Washington. Having conducted a security assessment across numerous buildings, Hines highlighted the need for further security to assist in keeping their tenants safe. The first addition was the installation of access control within the elevators and each tenant floor. However with an open lobby environment and public access to all areas of the facility, Hines looked to further enhance its security. 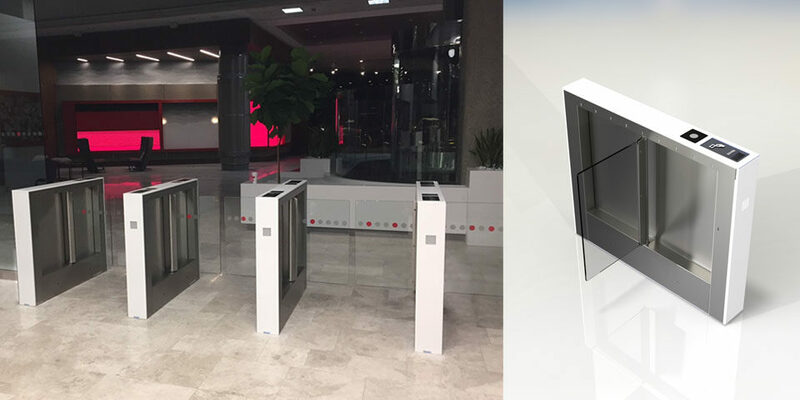 After much research, Hines chose to deploy Gunnebo’s OptiStile 720 optical turnstiles with swing glass barriers for all elevator lobby entrances both from the main lobby and back entrances. A total of eight (8) lanes and twelve (12) pedestals of OptiStile 720s were installed along Gunnebo’s HMI touchscreen controller which serves to control and manage all turnstile lanes. Not only was security a big factor in choosing Gunnebo, but also aesthetics and customization. 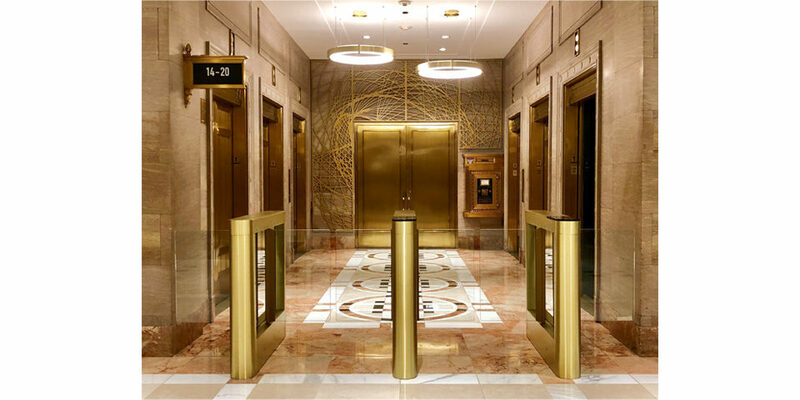 Meeting specific requirements with the buildings architects, Gunnebo manufactured the turnstiles in a brushed brass finish with stone lids to match the stone within the lobby. Furthermore, a visitor card drop was also designed in to the exit direction of the turnstiles. Bristol Airport has one terminal which sees 4.6 million passengers fly to over 90 destinations each year. Located 13km south of Bristol city center in Somerset, south-west England, the airport allows flights for the public transport of passengers and for flying instruction. To decrease the processing times to get passengers into the airside lounges, whilst preventing passenger stress and allowing passengers more time in duty free. Rationale: airports are fined if the processing is too long and duty-free is a big additional revenue stream for airports. It was also important to be able to measure passenger queuing times and to record their patterns of movement in order to establish efficient logistics. The information is also necessary to optimize the location of different service facilities and exits at the airport. After check-in, passengers at Bristol Airport scan their boarding cards in the queue management system, SmartQ, which can read different types of card (magnetic strip, bar code, etc.). SmartQ logs the time of arrival, validates each passenger's boarding pass and routes them to a certain lane. The database matches the time and location of each passenger to estimate and display accurate queuing times through the terminal. Queue times are combined to provide a complete picture of terminal operations, delivering detailed, real-time statistics on every journey and queue in the airport. "The system has revolutionized the way we look at and manage our passengers in the terminals. We can now monitor the current 'live' status of our entrance gates and see how quickly the passengers are passing through them. If problems arise we can quickly take action. We can also deploy our personnel at times and in places where they are needed most," commented Chris Ware, Head of Security at Bristol Airport. According to the Civil Aviation Authority, the number of airline passengers is expected to rise by 5% over the coming years. As the oldest airport in Germany, Hamburg Airport had to prepare for this predicted increase in volume by expanding and modernizing its central security checkpoint in Terminal 2. 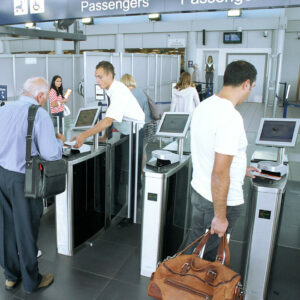 BoardSec optimized the flow of passengers whilst providing a high level of security. Waiting times for the passengers were minimized and airport staff could be used more effectively elsewhere.